May 23, 2017 – If folks that sell used hot tubs online were vampires, spring and summer would be their dead of night. They just seem to come alive (make that wake up) when the weather changes. Their victims are a rueful lot. And we hear many a sad tale about purchases made of an old hot tub from a private party. Is it (gulp) clean? We don’t want to cause you any sleepless nights, but the number of folks who neglect to maintain their hot tub water is nightmarish. If you buy a hot tub from them, it could come with loads of extras you never dreamed of like bacteria, dead skin, chemicals, and dried body oils. And if you’re really unlucky, they might throw in a used/dirty filter to seal the deal. Kick the tires…but not too hard. It’s not uncommon for the recipients of these old clunkers to get them home and set them up, only to discover these lemons have failing heaters and pumps, broken parts, and leak like a sieve. Often times these problems don’t even show up until the hot tub has been in place for a month or two. Is your “new” old hot tub well covered? There’s more to consider when buying a used hot tub than just the hot tub. There’s the cover too. And they’re not always new. Used covers can be hiding mildew and/or be waterlogged which can make them difficult to lift. They can also have vinyl that’s degraded by rain, sun, and extreme temperatures. Now you’re faced with a double-whammy; an old inefficient cover that’s making your utility meter spin a little faster every month, and sooner than later the expense of purchasing a new cover. Bad chemicals can create a monster. Back to the lab with those chemicals Igor. You might not know what they are. There’s no assurance that the hot tub chemicals inside the bottle are the same as the ones printed on the outside of the bottle. Or that they haven’t expired. They don’t make that hot tub or the parts anymore. Many hot tub brands and their repair parts are like the weather. They’re just passing through. 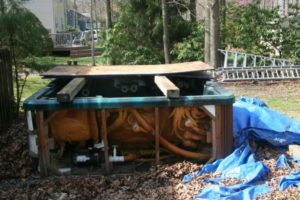 Buy an old hot tub and need a part? They could be long gone. Jury rigging a hot tub back to life is not most folk’s idea of fun. That said, we understand the desire to own one. At Olympic Hot Tub, we occasionally receive hot tubs in trade when our customers look to upgrade to the latest, greatest Hot Spring Spas has to offer. A number of these tubs, once deemed in renewable condition by our service team, end up refurbished and brought as close to “like new” condition as possible. The end result? You get the chance to purchase a hot tub at a lesser price without the mystery or hazard of buying from a third party online! All renewed tubs carry a minimum of a 90 day warranty on parts & labor as well for added peace of mind. If you have your mind set on a new hot tub but you’re on a tight budget, we have another option! Our line of Freeflow Spas are wonderful hot tubs built by Hot Spring Spa’s parent company. They offer dependability, ease of care, warranty, and support from us at a very reasonable price. We’ve found that some used hot tubs purchased online actually cost more than a brand new Freeflow Spa. If you’re interested in a refurbished hot tub, contact our Service Center to see what’s available. If you feel that a Freeflow Spa is the way to go. You can check them out on our website, or visit any one of our convenient Puget Sound locations. Happy hot tub hunting!